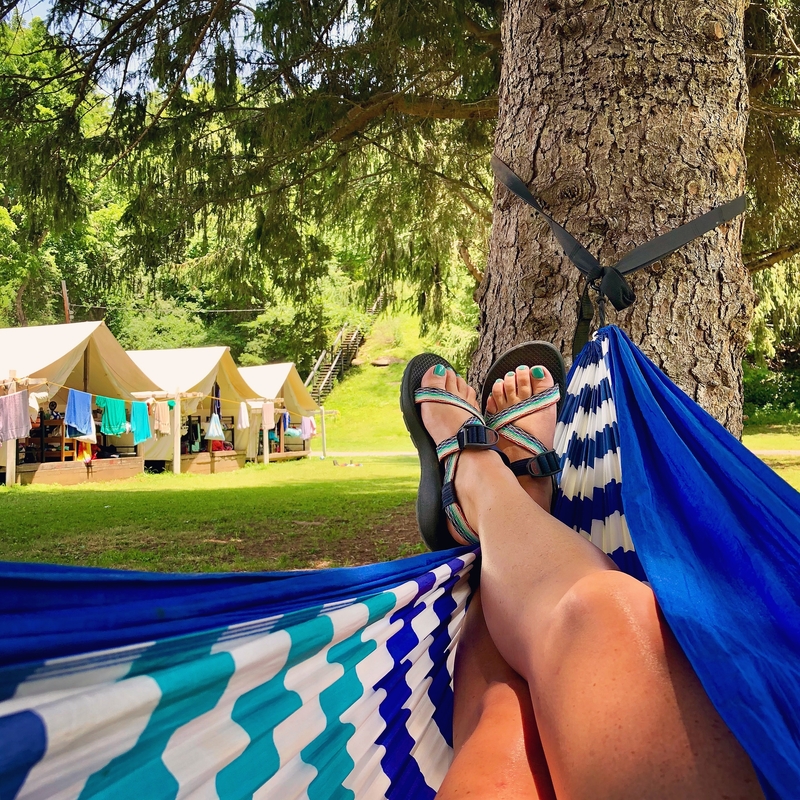 Editor’s note: Every summer Camp Director Elizabeth Shreckhise blogs about her top five favorite things about camp that summer. You can find an archive of the old ones at the previous link. Program Director Casey Tucker also wrote one last year because it was his first summer in that position and everyone wanted to know his impressions! This is Elizabeth’s 2018 edition, with some exciting new developments at camp that she just loved, and they’re in no specific order, they’re all favorites! I don’t think I’ve ever had a better staff of counselors working at Alleghany. They were united, hard working, positive, professional, and at camp for all the right reasons, such as a passion for kids, educating others, reveling in nature, and working on a ladder in their own career goals. Their dedication, focus, and camraderie made my and Casey’s jobs that much easier. During the summer I was so proud of their accomplishments and hard work, and when I reflect back on this team and the individuals involved and the spirit of the summer I am just as proud and awed today! I personally witnessed immense personal growth in each and every one our counselors and junior counselors, and saw many of them come out of their shells, grow in confidence, do something outside of their comfort zone, and more. I’m humbled, overjoyed, and so so proud of them. Give them a hand wherever you are because it was they who nurtured and guided your kids at camp and they did it with grace and aplomb! 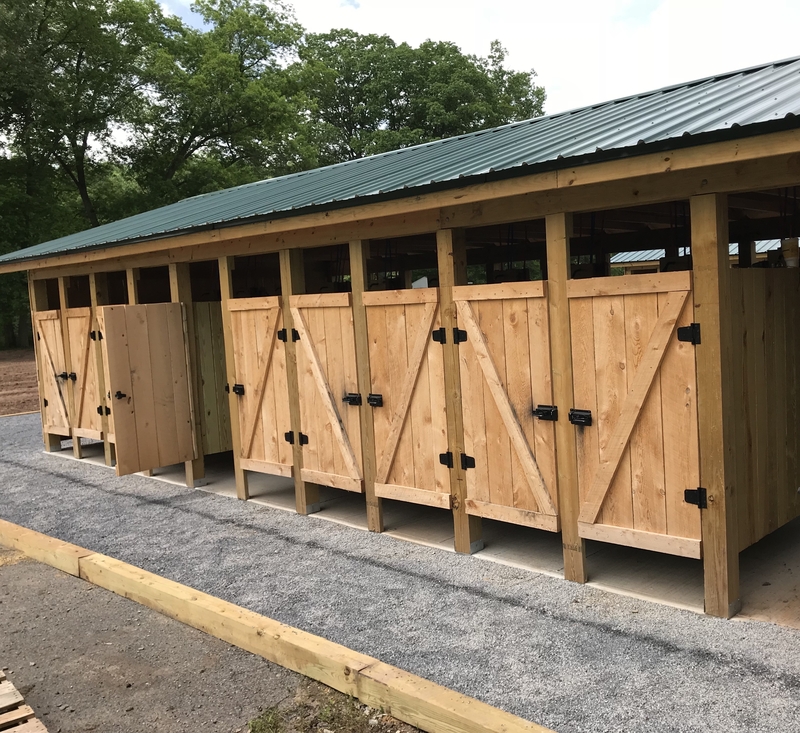 If you followed the blog during the off-season (and some of our Facebook Live events), you know that this year we rolled out a MUCH needed camp infrastructure improvement in the form of a new Bathhouse. What can I say? I’m humbled again and this time it’s by our always creative and hardworking Facilities Director, Garrett O’Dell. Oh Garrett and all your helpers and suppliers, thank you a million times over! The new Bathhouse exceeded all expectations. 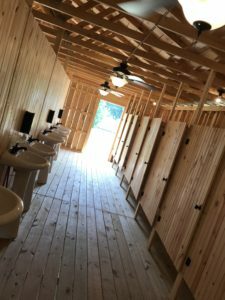 In fact, when I finally got down to the camp showers to take a shower myself, I got so hooked that I only used the Bathhouse for when I needed to wash my hair, instead of my own shower in the Cottage where the directors live during the summer. 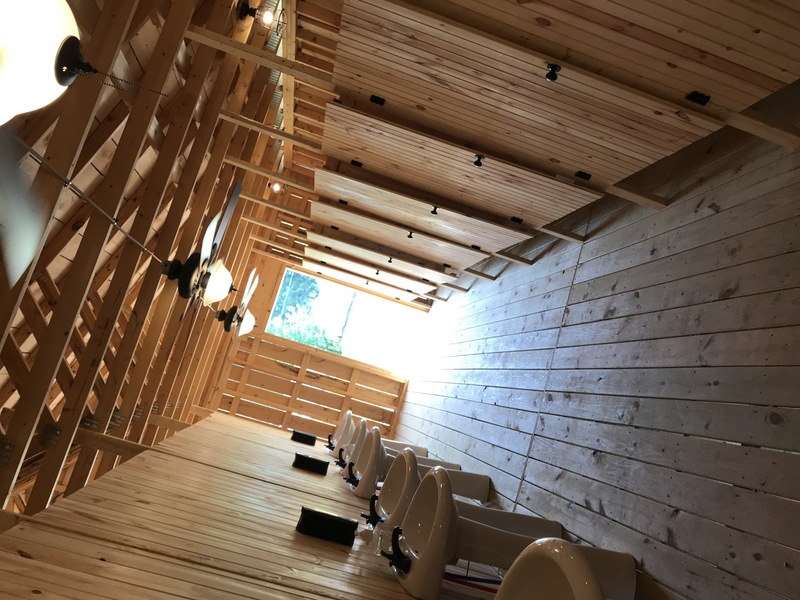 The outdoor showers are such a peaceful experience, with mountain views from every stall/every direction (if you’re tall enough!). And the sheer number of shower stalls and toilets cut down so significantly on wait times, which was also a huge improvement at ‘Ghany! We loved it! We had an “International Night” at ‘Ghany this summer and it was so wonderful that we owe this one a blog post of its own with lots of fun detail, so be on the lookout for one from Casey sometime soon. 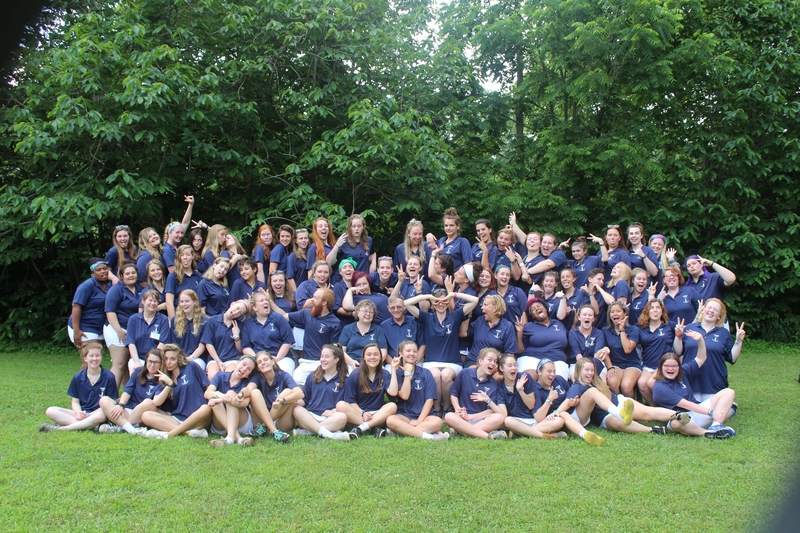 But the short version is that we were lucky at camp this summer to have staff members from all across the world. It was a regular United Nations! And we didn’t want that to pass without really getting a very specific cultural exchange beyond that which happened every day just by having them there. We wanted to share their culture, food, music, and whatever else with all of camp, so we decided to have an International Night during both First and Second Term. Director Emeritus and Owner of Camp Alleghany for Girls, Sam Dawson, actually gave us the idea after a camp conference session he attended last summer in Orlando. We set up our International Night as an outside dinner picnic, with each table serving a sample of food from a different country. The staff from those countries made flags of their countries to hang as signs on the tables, and came up with some fun activities to do with the campers as they visited those tables and a truly fun time was had by all, with campers raving about how much they enjoyed it! I was so pleased with the success of it, how much fun the campers had, and of course the delicious food, that this will definitely be something we do again. Camp is ensconced in beautiful nature so it’s easy to take for granted our magnificent backdrop and setting, making more like a given than a potential fave. But that would be wrong! Last year after hearing keynote speaker Florence Williams, author of The Nature Fix, speak at our National Conference, I dove head first into reading and learning about the benefits and healing powers of nature, and the effects that nature has on humans. At first glance Williams’ book contained things that I feel I inherently knew already, and have talked about in the past, and already fully subscribe to and believe in. But taking the time to really reflect as I read the book somehow put it together for me in that all-important “research-based” terminology on why humans are healthier and happier in nature. Something deeper just clicked for when when I read it. Casey and I took this and ran with it, using a lot of the information and ideas with our counselors during Staff Training, reminding them that just by BEING at camp, we’re already putting ourselves in a healthier environment. We talked about reduction of screen time (which is of course a whole other topic that I have blogged about before, and will continue to be an advocate and crusader for). I truly believe that our society is in a mental health crisis because of over reliance on technology and a drastic increase in time spent indoors, a move that is unprecedented in all of human history and all of human culture. It can’t be good for us, and research proves it. 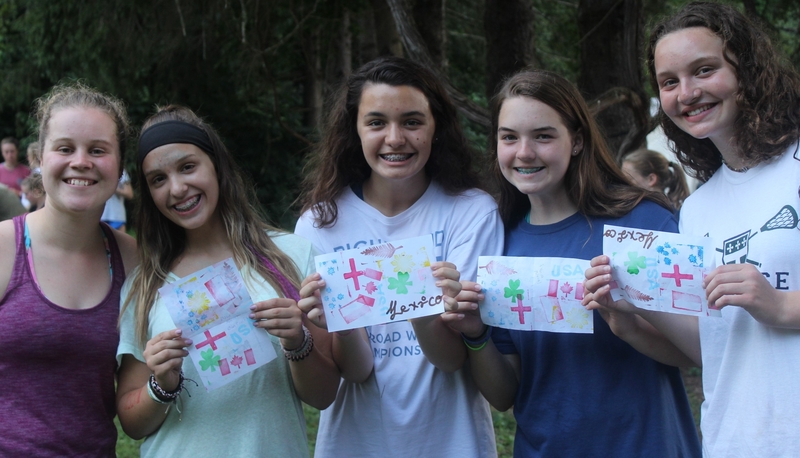 So we refuse to take nature for granted at Camp Alleghany for Girls! And we borrowed a phrase from my friends at Camp Twin Creeks to really feel and share our gratitude for nature; the phrase is “nature appreciation moment,” or “NAM.” We put a special focus on just stopping to enjoy the NAMs we saw around us every day — a beautiful sunset, fog on the river, the moon rising over the mountain, anything. We stared during these moments, soaked it all in, and acknowledged them as NAMs. I believe this really contributed to an even healthier and happier staff and environment at camp this summer than we usually have. Gratitude is a powerful thing! Which brings me to…. As every parent, teacher, and babysitter knows, raising and working with kids is hard work! Rewarding work. Fantastic work. But hard work. And we also all know that to be our best with and for kids, we simply have to take care of ourselves first. Whether that’s eating right, sleeping well, and exercising, getting out in nature or getting together with friends, or reading or doing a favorite hobby, it’s vital that we nurture ourselves to do our best with nurturing the kids in our lives. The camp world recognizes this and helps camps to better integrate self-care into a holistic plan for running camp. In fact just last year at the American Camp Association National Conference I went to a session on director self-care. It was an impressive workshop for professional development and some very key things stood out to me. Of course the whole concept of the session was, like my intro above, if directors aren’t taking care of themselves, how can they expect to take care of 300 other people in camp? The presenter gave a wonderful analogy of the oxygen masks in an airplane, and how it always says to put yours on before your kid’s. She then said, “If you tried to put 200 oxygen masks on all the campers before you put your own on, you would be dead.” This was very powerful to me, and I took it to heart. Photo by camp nurse Katie Webster. Still, I decided I wanted the counselors to really focus on self care as well, in a way that was more conscious and specific than our general advice in the past to take care of ourselves. So we did! We had an acronym and everything, that we used to remind us to be gentle with ourselves, take time for relaxation, fun, make sure to accomplish something each day/week, work in some exercise, etc. I tried to remind the staff every morning, or almost every morning, at our morning meetings to make sure they were taking care of themselves, and that they can’t take care of anyone else if they’re not taking care of themselves. And in my first summer as the Director, I took to heart that I was a role model for this very practice! I wanted to practice what I preached. I decided to take my own days off this summer. It still sounds like blasphemy writing it out — take time off during the summer?!?! Wha, wha, wha, what???? But I did. I took one day off each term, so two full days off and away from camp. I trusted my amazing Admin Team to run camp, and the Head Counselors were phenomenal as well. Camp runs like a well-oiled machine (most days) anyway! So yes, I had two days off, and I took them on Saturdays when my husband Matt was at camp, and we went out as a whole family to eat and enjoy lovely nearby Lewisburg, West Virginia. Part of my days off were also just spent lounging in my room relaxing a bit. Even though I was in camp, I turned off my walkie talkie. Of course, I was available for emergencies, which didn’t happen, and writing about this still brings up the familiar pangs of guilt of actually stepping away from my job for a day, but in the end I reminded myself over and over that I value time off for the counselors and feel they really need it, and it’s required for them!! So we should make it required for directors and the Admin Team as well. Which I did. I required the Admin Team to have time off this summer, and I will continue to focus on this in years to come, as I felt it was very healthy for all of us. But moreover, a staff that knows its directors care about them individually, care about their health and happiness, care about their work-life balance, care about them getting their “me time,” not just in the regular way, but in an underlined, emphasized, transparent, and conscious way that becomes a very visible value at camp, that staff is more empowered, secure, confident, and at ease, which of course translates into them bringing that value to how they handle their jobs. Which brings me full circle back to #1 — our amazing staff! 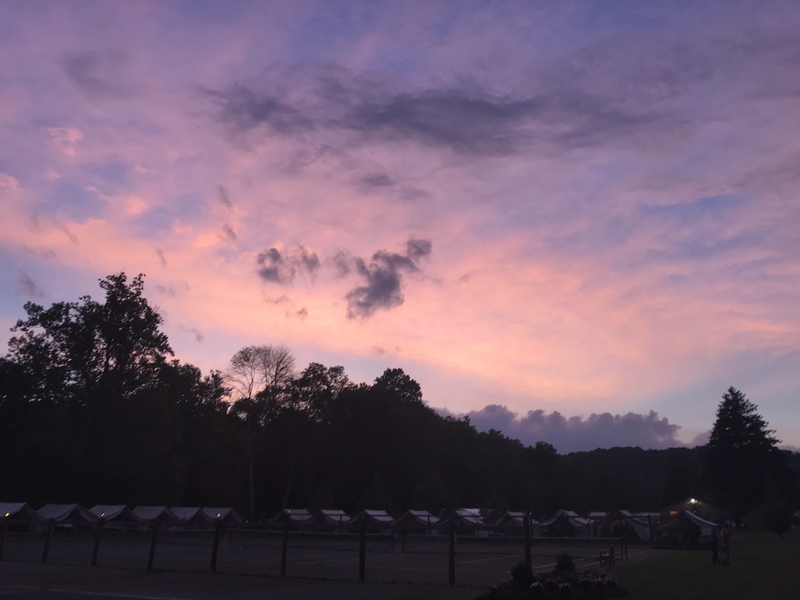 It was a great summer for them, for campers, for me and my team, and for all of us to be in our happy place on the banks of the Greenbrier River, soaking in nature, soaking in our friendships, and loving life!